To say I am grateful for how far KoKo Adora has come would be an understatement. There have been so many blessings that have helped build the brand from a dream into reality. One opportunity that has surprised me was doing designer and boutique markets. It can be difficult to find ways to reach people so when I was offered this new opportunity to be at markets, it really did become a blessing in disguise for many reasons. 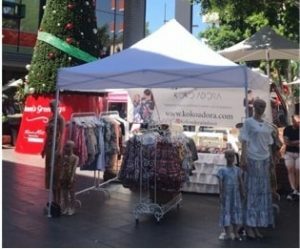 I was very fortunate to have been noticed and approached to attend a boutique market earlier this year and we have been attending markets ever since. It has helped the brand reach new people in a much more powerful way then on the internet. It is very hard to express quality and demonstrate detail online so the overall feedback I was able to get first hand, appreciating designs and quality, far outweighed the actual results from the markets to me. When someone shows appreciation for your hard work and notices the small things you put a lot of thought into, it is a heart-warming feeling.So much consistent hard work has been put into the brand, so the live encouragement has really helped me dig deeper to push further with my dreams and passion. It is not only a deep feeling of happiness but a sincere feeling of relief and gratitude when you become overwhelmed with compliments, support and even sell out of new styles in one day. A lot of small business owners are faced with so many obstacles and are forced to learn so many different facets of business in peaks of steep learning curves, only to be faced with the uncertainty of acceptance and support at the end. To take a leap of faith and see that people want you to do well and genuinely love your product is mind blowing. Up until being at the markets I haven’t had that face to face interaction with many customers and it has proven to be priceless. Off course selling items online is satisfying and indirectly sends the same messages but there is something truly special about dealing with people face to face as well as seeing the products in real life which cannot be compensated for online. 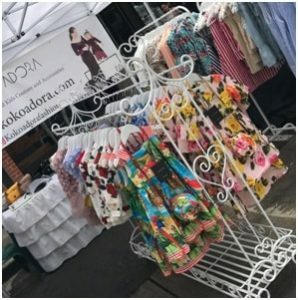 The markets have also attracted people who have a genuine appreciation for supporting small and local businesses, so it has meant as a brand I have indulged in a calibre of amazing people who have genuine understanding and appreciation for all the hard work that goes into KoKo Adora behind the scenes. The fact that I am mobile and can reach new people in new areas has also been amazing. I have been able to get closer to some loyal customers who wanted a closer look at items, engage and understand what people want to see more off. I remember selling an item to a woman who wasn’t a mother yet, but she was so in love with the dress and matching bag she bought it for her future daughter! I was speechless and tried to talk her out of it in case she had boys, but she insisted she loved the dress so much and the quality was so nice that she would eventually find a little girl to give it to. I can’t really describe the emotion, I was blown away and still am a bit speechless over that moment at the markets. 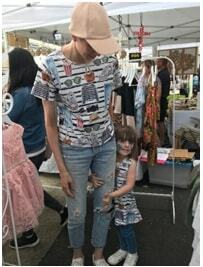 On my second market In Rouse Hill I remember seeing a mother and daughter wearing a matching outfit I had sold them at the market prior, they had come back to show me and get some more matching items. Suddenly, I could see the love in unity and started to feel emotional. Seeing the outfits in photos and on people in real life just felt unbelievable. I remember calling my mother after they left and jumping up and down in excitement to tell her how amazing they looked in the outfit and she laughed and told me to calm down and that she was so happy I got to see that. I have found it makes it a lot easier for people to trust and buy from KoKo Adora once they have seen, felt and experienced the unique qualities of the brand at the markets. The atmosphere is incredible, and I have not only met so many wonderful new people that love KoKo Adora but also met some other incredible small business owners who areequally dedicated to their passions. This kind of inspiring atmosphere is like a whole new realm of encouragement. One other thing, but by far the most powerful thing, outside of brand success that the markets has made me realise, is how little I could have achieved so far without the support of my family. My husband who also works full time sacrifices his day off to pack, unpack and set up the entire stall for me on a Sunday. My parents mind our two girls and family from near and far come to promote and support the brand. The brand started because of family, for other families and continues to grow because my own family is at the core of its function. Between luck and a blessing, I am happy I have the support from people and family to continue to pursue KoKo Adora as a brand and my new venture at the markets as well, which I am thoroughly enjoying. We hope to some more of you at the markets and thank you to our awesome followers who have been coming along and finding us. You can follow us across our social media channels to know where we are next.